Barnes & Noble now offers a range of Nook devices from the Nook Simple Touch to the Nook Color to the new Nook Tablet. These devices are portable and fun and even have some features that the Kindle doesn’t have. When it comes to recreational reading an e-ink reader is the way to go. It doesn’t have all of the bells and whistles of a color screen, but you can read it in the sun and it is easy on the eyes. Just like a regular book. One of the most amazing features of the Nook Simple Touch is that the battery can stay charged for 2 months. 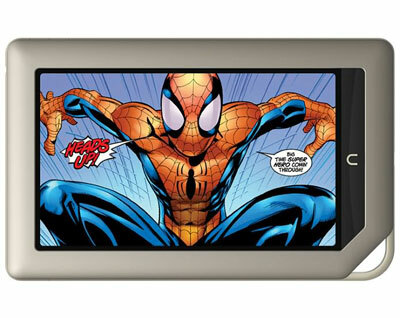 It also has a touch screen, built in Wi-Fi, and has a slot for a microSD card which makes it expandable up to 32 GB. The B & N bookstore offers over 2.5 million titles and you can preview titles for free. Plus they have Free Friday titles and you can try magazines and newspapers for free. You can also use the Nook to borrow library books in the ePub format. The Nook Simple Touch supports ePub, PDF, JPG, GIF, PNG, and BMP formats. We are still fans of the Nook Color and the price has dropped. 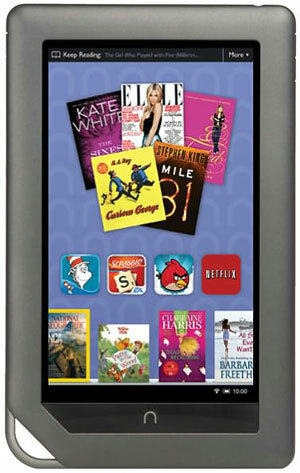 We love the 7” VividView Touchscreen, it makes viewing magazines and color books a pleasure. It is also great for movies and TV shows, Nook comics, and kids stories, which come to life on the Nook Color. There are thousands of apps available for the Nook Color and it comes pre-loaded with Sudoku, Crosswords, Chess, and Pandora. You can also browse the web and check email with the built-in Wi-Fi. Of course with the Nook Color you also have access to the B&N bookstore, and the Nook will keep your place no matter which device you are reading your Nook titles on. The Nook Color supports ePub and PDF, has a microSD slot, it also supports other document types such as: CBZ, XLS, DOC, PPT, TXT, DOCM, XLSM, PPTM, PPSX, PPSM, DOCX, XLX, PPTX. You can also watch Mp4 and flash videos, load photos in JPG, GIF, PNG, and BMP, and listen to audio in Mp3, Mp4, and AAC. Now the fun begins. The Nook Tablet is very similar to the Nook Color and offers everything it has, plus more. First off, it still has the microSD slot, but the Nook Tablet gives you the choice of the 8 GB or 16 GB model. This tablet has longer battery life and is faster and has an even more vivid screen. It is powerful and offers the fastest web browsing and download experience yet. It is also great for multi-media; and displaying movies, TV, and music; from Netflix, Hulu Plus, and Pandora. The Nook tablet really brings graphic novels to life and offers everything the Nook Color has, only it’s faster, stronger, and brighter. You also get access to the Nook Cloud with the Nook Tablet. If you are trying to decide between the Nook Color and the Nook Tablet our suggestion would be to pay a little extra and go with the Nook Tablet. Another nice thing about the Nook are the Nook reading apps. You can download free Nook reading apps for iPad, iPhone, Android, PC, and Mac. So you can take your Nook Books anywhere and read on any device you own, and the Nook reading app will even bookmark where you left off and save your place over all of your devices. In a few short years the Nook has come a long way and is truly all grown up with the new Nook Tablet.